This past Wednesday, Disney on Ice and Feld Entertainment invited my family to be there guest at Disney On Ice: Princesses & Heroes in Hartford. 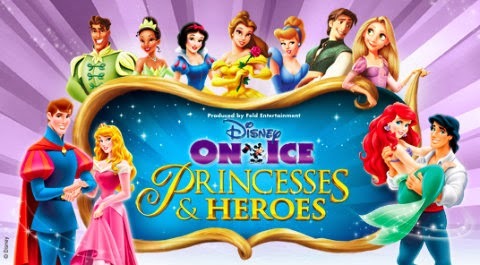 Today I thought I would share with you my review of Disney On Ice: Princesses & Heroes. This was our first time attending a Disney on Ice show and we truly experienced a bit of Disney magic last night. The awe in my girls eyes could have qualified for a Disney commercial. Disney is a master at creating family entertainment that not only is flashy and fun but strikes a sentimental chord between parents and children. Tinkerbell commands the stage with fast-paced ice-skating maneuvers and a wand that sprinkles glitter over the ice. Her magic brings to life the stories of eight Disney princesses and their heroes. The stories are acted out and skated to tracks from the movies including music and narratives. Some of the stories focus on beautiful skating to Disney music, such as Snow White's I’m Wishing for the One I Love. Other routines include costumed casts and action sequences with fun tricks on the ice and props. Mickey and Minnie asking all the little princesses and heroes in the audience to stand up at the beginning of the show. Lilyana and Sophia's face looked so priceless. Aladdin swinging from the top stage on a rope to the ice floor. Cinderella's coach shooting off fireworks. If you enjoy figure skating tricks, you won't be disappointed. The routines in the show contain a fun mix of jumps, unusual tricks using props and costumes, romantic ice-dancing, and purposeful bloopers for comedy. The costumes are incredible. The characters look like they could have stepped out of the original Disney films. The stories include fun side characters such as Flounder from The Little Mermaid, Lumiere from Beauty and the Beast, the Seven Dwarfs from Snow White, and the dragon from Sleeping Beauty. The princesses include: Ariel, Jasmine, Cinderella, Belle, Tiana, Rapunzel, Snow White, and Aurora. And the music was just perfect! My daughter's absolutely LOVED the show! They asked lots of questions and never looked bored. When I asked them what they enjoyed best, Lilyana said "Sleeping beauty and the dragon breathing fire" and Sophia said "Minnie, Mickey Mouse and Belle." Tickets: Ticket prices are $25, $30, $60, $80. Have you attended Disney on Ice: Princesses and Heroes yet? We would love to hear what you thought of your Disney experience here in Hartford, CT! Thank you! We had so much fun!! Oh my goodness that looks so fun! My oldest daughter would be amazed! We had sooo much fun and I'm sure she would LOVE Disney On Ice!! Looks like every little girls dream. I will definitely need to look into this next time they are in town in our area! It really is, my girls had a blast!! I cannot wait until this comes here, my niece would love it! It looks like you all had a wonderful time! We had so much fun! I can't wait to take them again! Oh, that looks like so much fun! My daughter is getting into the "princess stage" and I think she would love this show. It really is, we had so much fun! What a fun show!! We haven't gotten to see any of the Disney on Ice yet. We recently saw a Tale of 3 Princesses which was a stage show--my kids LOVED it (even the pre-teen). I haven't seen that one! I'm going to add it to our bucket list!!! I think I like shows like Disney on Ice even more than my kids. I hope I get a chance to see it this year. Hahaha, I thought I was the only one? I love Disney Princesses!!! This looks like a blast! I'd love to take my daughter someday! It really is, we had a BLAST!! Oooh, this looks like so much fun! We recently took the kids to Disney Live, and I can't wait to check out Disney On Ice! We've been dying to see Disney Live!!!! can't wait until my daughter is a little older to take her. How old is she? This is the perfect show for all ages! I totally agree, we had so much fun! Wonderful photos! We have never been to any of these shows but this one looks like so much fun. Nice to see your daughter enjoyed. She must have been so happy and excited! Thank you, and they really did enjoy it! They talked about this show for weeks, they still talk about it! I cannot wait until my daughter is old enough to enjoy these. I remember going as a girl. Thanks for sharing!! You are so welcome! And this show is perfect for all ages!! How fun!!! My little girls would absolutely LOVE this!! They really would, my girls had a BLAST! to share the experience with them. It's a great experience for parents and children! We had so much fun! I would love to take my girls to see this show! They are huge Disney fans and have been to one Disney on Ice show a couple of years ago. They would, we had sooo much fun! I would love to go to Disney on ice!!! Looks Amazing! I have fond memories of Disney on Ice and the Icescapades - I'm glad your family got a chance to enjoy a show! Thank you and we really did enjoy this amazing show! I would love to do this with my now 20 year old daughter. Disney on Ice for kids of all ages even grown up kids. What a special event to remember. Oh you both would enjoy it, it really is the perfect show for any age!! Annabelle and I went to Disney on Ice show, and I should probably take her to another before she gets "too old." At 8, she's getting close. I need to search out the performance schedule. It really is, we all had a BLAST!!! We have never been to a Disney on Ice before and this would be perfect for boys and girls. Thanks. It really is the perfect show for boys AND girls!!! How fun! Disney on Ice is always a blast! I couldn't agree more, I can't wait to take them again! Too bad it will never come close enough to me to take my daughter to. She would love it! Oh nooo! :( She would have LOVED it!! !